The “Queen of Quit” has done it again. 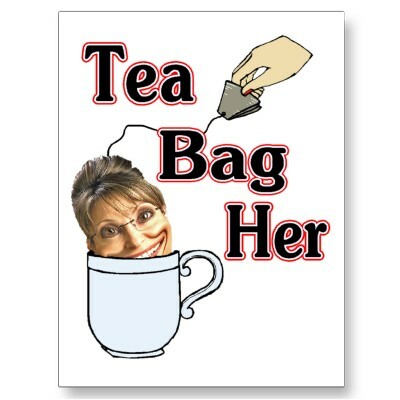 It is now official, Sarah Palin has quit the Republican Party and joined the Tea-Baggers. For the second time in a month Palin has ignored the Republican Party and endorsed a competing Tea Party candidate. First she endorsed racist Tea-Bagger Rand Paul over the Mitch McConnell endorsed Republican Trey Grayson in the Kentucky Senate primary. Now she has endorsed Tea Party activist Clint Didier over the National Republican Senatorial Committee endorsed Dino Rossi in the Washington Senatorial race. This is good news for Democrats. 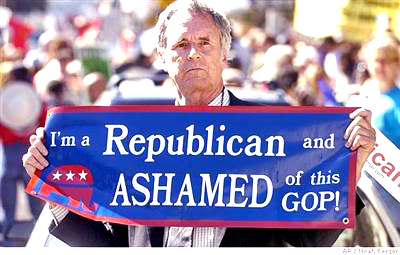 Republicans and Tea-Baggers share many of the same right-wing conservative philosophies. Consequently the newly emergent Tea Party draws virtually all of its members from the Republican Party. The G.O.P. gets smaller and then must publicly battle with Tea-Baggers before even earning the chance to run against the Democratic Party candidate in a general election. The Tea-Bagger or Republican that wins the primary then comes to the general election already dripping with mud. Advantage – Democrat. This scenario is presently playing out in the Washington state Senatorial race. Didier (Tea Party) has already attacked Rossi (Republican), painting him as firmly entrenched in the Republican establishment. “If people want more of the same, the McCain or Bush type of governing, then they can support Dino,” Didier said in a statement earlier this month. All of this my friends, is another glaring example of the “Palin Rule”. 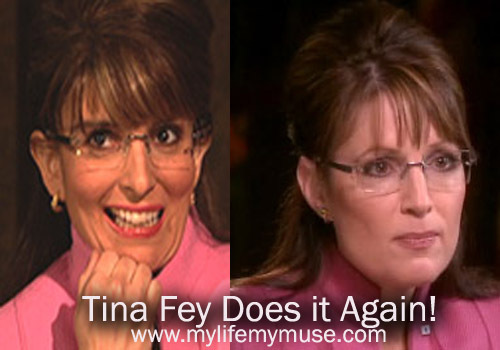 Whatever Palin touches, turns to crap! Silence is golden. If only we could get a little of that from Sarah Palin. You would think that the educationally challenged former ex-quitting Governor of Alaska would realize that in light of the recent Gulf Coast oil rig disaster, now is not the time to extol the benefits of more off-shore oil drilling. Then again, you would also think that an interview blowing, turkey head grinding, “death panel” lying, crib note relying, logic defying, Tea-Bagger buying, spotlight eyeing narcissist would not be capable of maintaining the interest of the “lamestream” media. 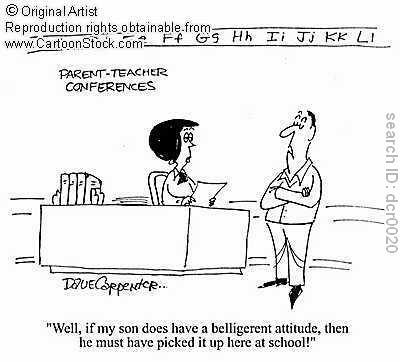 Ah, but such is apparently not the case. Alaskans understand the tragedy of an oil spill, and we’ve taken steps to do all we can to prevent another Exxon tragedy, but we are still pro-development. I repeat the slogan “drill here, drill now” not out of naivete or disregard for the tragic consequences of oil spills – my family and my state and I know firsthand those consequences. Wait a minute. 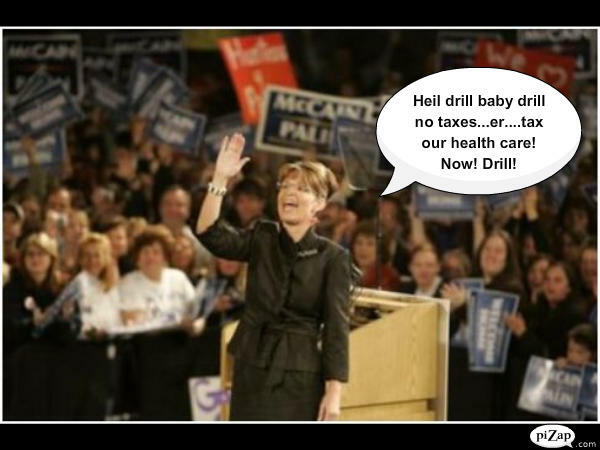 If she repeats the slogan “drill here, drill now” not out of naivete or disregard, then what is her reasoning? Sarah would you please expound on that a little? We await your incomprehensible response with baited breath. Oh, yippee! She spoke again on Saturday in Missouri before a bunch of Republicans. Inasmuch as Missouri is the “Show Me” state, we are sure that Ms. Quittypants would feel compelled to show the audience some facts to support what she is talking about, right? Not so fast. 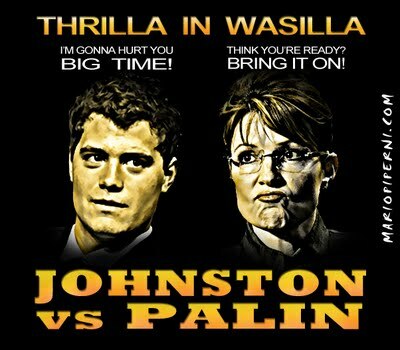 Palin deemed the oil spill to be “very tragic”, but she then told her audience,… ready for this? “I want our country to be able to trust the oil industry”. Trust the oil industry? Perhaps we should trust Halliburton, Blackwater and Goldman Sachs too. Did the Exxon-Valdez disaster in her own backyard not teach the brain-dead corporate lackey a little something about the type of trust that can placed on oil companies? 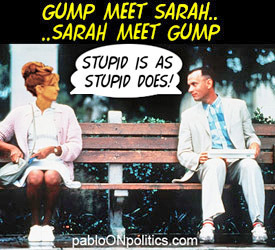 Sarah Palin is simply as stupid as stupid comes. She said, listen people, don’t you know I’m “mavericky”? Republicans: Big Banks and Big Fish Stories! It was refreshing last weekend to see both President Obama and the main stream media publicly call out the Republican Party leadership and the banking industry for jointly trying to defeat the passage of a strict financial institution regulatory law which is aimed at preventing another financial meltdown followed by a taxpayer bailout. Both Obama and CNN‘s Candy Crowley exposed the ugly truth that G.O.P.ers Mitch McConnell and John Cornyn met with two dozen top Wall Street executives last week in an effort to craft a means to defeat any strong financial institution regulation proposed by Democrats. have not exactly been welcomed by the people who profit from the status quo – as well their allies in Washington. This is probably why the special interests have spent a lot of time and money lobbying to kill or weaken the bill. Just the other day, in fact, the leader of the Senate Republicans and the chair of the Republican Senate campaign committee met with two dozen top Wall Street executives to talk about how to block progress on this issue. Lo and behold, when he returned to Washington, the Senate Republican Leader came out against the common-sense reforms we’ve proposed. Then on CNN‘s State Of The Union on Sunday, Candy Crowley grilled Mitch McConnell as to whether the meeting took place, what was said during the meeting and if, and why John Cornyn was present. McConnell was forced to admit that the meeting took place and that Cornyn was present. He appeared to contradict himself however, while trying to explain the content of the conversation. First he said, “Well, we certainly didn’t talk about blocking the bill, I don’t know anybody who’s in favor of blocking this bill.” Then when Crowley followed up by asking what the Wall Street executives asked McConnell and Cornyn, he said, “Well, they have concerns about the bill,” adding that he thought the Senate ought to “go back to the drawing board” and fix the legislation. So, it appears that the G.O.P. gameplan for financial reform mirrors its failed opposition to health care reform: Scratch the whole thing and start over with some new regulation at a later date, preferably after the November 2010 elections. Once again, the Republicans are a “Party Without a Plan”. 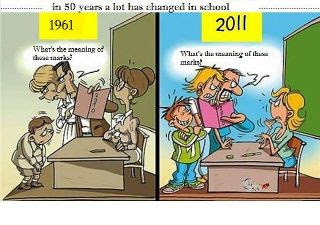 Candy, [Obama] is the one who is trying to politicize this issue. We are the ones who are trying to get it right. Sen. Cornyn is a United States senator from Texas. He is going to be voting on this issue like all the rest of us are. Simply because we are all involved in politics, as is the president, it doesn’t mean that we can’t discuss issues with people that we meet around the country who are deeply involved and concerned about what we are doing. Boy Mitch, that really cleared things up. We still don’t understand why Cornyn was there and in the same interview you said that that the bill should be passed and that it should be scratched. What are you talking about? Why don’t you just admit the obvious truth. The Republican Party and the Wall Street bankers are in bed together in a manner that resembles so many other G.O.P. tawdry trysts. Please remember to click on the song link below to familiarize yourselves with the tune and to have more fun singing along with today’s topical song parody. Have fun! Sarah Palin is not the type to disappoint. When the former ex-quitting governor of Alaska gave up on her constiuents and walked away from her job last July, we all worried that we would lose our favorite source of entertainment and target of witty criticism. There was no need to worry however, because she announced that her memoir would soon be released and that there would be a nationwide small hamlet book tour. She delivered in true Palin fashion. The book was a non-fact checked, hilariously poorly written work of fiction and the bus tour turned into a secret private jet tour that nonetheless drew a multitude of bloodthirsty shut-ins into the light of day for all to marvel at. A freak show if you will. In addition to the book, she also informed the world that her plans were to embark as a featured speaker on the lecture circuit. As a warm-up for this new vocation, she flew off to Hong Kong so as to address a group of investors. The reviews were not kind. Consequently, the demand for her services dwindled to the point where she was forced to accept gigs at such spectacular forums as the Bowling Convention and the Wine and Alcohol Wholesalers’ Convention. imagine the fun we will have when the transcripts of those speeches become public? She then accepted a position as a guest host on the Fox News network. She promptly began to appear on such shows as Hannity, The O’Reilly Factor and The Glenn Beck Show. Needless to say, she fit right in with the Fox menagerie. She was at ease in the comfortable environment of friends and candidly answered such hard hitting questions as, “What is your favorite color?” and “Does it snow a lot up where you live?”. We are sure to have much more fun as she appears regularly on these programs. 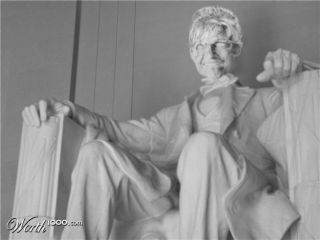 …if I believed that that is the right thing to do for our country and for the Palin family. I think that it would be absurd to not consider what it is that I can potentially do to help our country. I won’t close the door that perhaps could be open for me in the future. Just imagine all the side splitting laughs we will enjoy as she spars with the likes of Mitt Romney, Newt Gingrich and Tim Pawlenty in Republican primary debates. “Please give me a moment Mr. Romney as a I consult the crib notes on my hand”! “Mr. Gingrich, do you mind if I call you ‘Cute Newt'”? The possibilities are endless. Of course she will also be required to appear on serious Sunday morning news programs such as Face The Nation and Meet The Press. We will all enjoy looking at the puzzled visages of the hosts as she tosses up one of her signature word salads. Not to mention, a long presidential run will also afford Levi Johnston the opportunity to have a book tour of his own as well as the chance to appear on even more gossip minded television shows. This type of hypocricy is typical for the Republicans. Here they are calling themselves the “pro-life” party while at the same time asking people to request that God kill somebody merely to prevent them from casting a vote in the Senate. The comment is particularly damning of Coburn, who as a physician, has taken a solemn oath to preserve lives. If God were to pay any attention to that monster, not only would at least one Senator lose his life but so would many of those presently uninsured sick persons who’s lives will be saved by health care reform. Merry Christmas to you too, Mr. Coburn. That was obviously an indefensible act of violence proposed against two of the governor’s daughters. Palin had every reason to fear for her daughters’ safety and to remove them from their schools if she found the threats to be credible. She also had an obligation to report the threats to the school administration and to local law enforcement agencies, if not to protect her own daughters, then to protect and warn the other students that remained in those schools. Problem is however, it does not appear that Sarah Palin reported the threats to anyone. The JuneauEmpire.com reports that former Juneau School District Superintendent Peggy Cowan was superintendent during the period in question and said she never heard of such concerns. They also report that Juneau Police Chief Greg Browning similarly said his department has no record of ever being alerted to such threats. 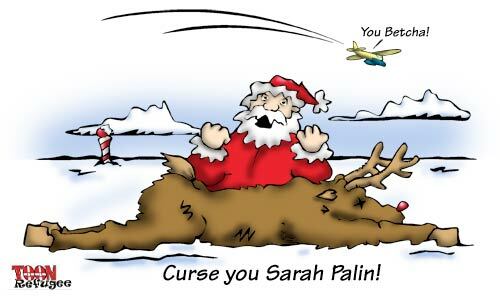 Finally, it was also reported that the Alaska State Troopers provide a security detail for Palin, but trooper spokeswoman Megan Peters said the first they heard about the allegation was from Palin’s book. This raises the question, just what in the wide, wide world of sports is going on here? Did these threatened gang rapes ever really happen? If so, why did Palin fail to report such a serious situation to any of the proper authorities? If she failed to report the threats in an attempt to protect her daughters’ privacy, then why did she reveal the whole situation in her best selling book? 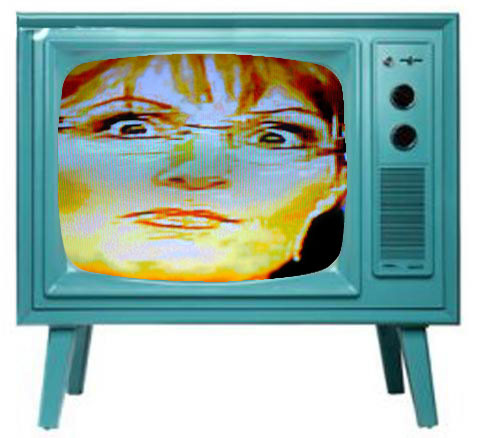 Can anything that Sarah Palin says be believed? Lastly, as any and all of you self-respecting Seinfeld fans out there already know, today is the holiday of FESTIVUS. You know, “Festivus for the rest of us”. So, without further adieu, Lynnrockets’ Blast-Off would like to wish all of you fellow Rockateers a Merry Festivus! In honor of the troops, please remember to click on the song link below to familiarize yourselves with the tune and to have more fun singing along with today’s holiday song parody. Or are you at a Christening?